I am involved with many different roles at the company. My main responsibilities are to maintain the facility operations and systems and manage construction projects. I am on call 24/7/365 - if something happens to Corporate Headquarters, I will be there. I can honestly say I probably know more about Corporate than anyone else because I have been involved since we began construction of the building in April 2012. I literally know this place ceiling to floor- every light bulb to every doorknob. Things change minute-by-minute most days. I am constantly prioritizing projects and tasks. Emergencies always take precedence but I strive for a 15-20 minute response time to reported issues and 2 hours max for resolution. I also work on company events and meetings with the HR team. These projects can get pretty interesting like when I designed and built a giant couch piñata and constructed a large slip and slide. The team took turns "beating the couch" which symbolizes the struggle between a sedentary lifestyle and our mission of helping customers achieve their best self through leading an active life. Everyone is working toward the same goal of changing lives. I see each team member as my customer, so I want to give them the “wow customer service” when I’m working to resolve their issues or problems. I love the amount of passion and energy the team puts into projects and always try to match or exceed that level. I also really enjoy working on customer related projects. I recently helped create a photo gallery wall of customer transformations at our corporate office and get to be involved with our new Lift Life Foundation that helps rebuild gyms at underfunded schools. And soon I'll be starting construction of the onsite company café. Jim and the director of facilities, dylan, install gym equipment for the lift life foundation. Making sure that Corporate and our Portland offices are in the best condition possible is very important to me. I see it as a way to serve our team members. And, I take pride in maintaining an environment that we can all be proud of when a guest or athlete visits us. My professional growth also keeps me motivated. I was selected for a scholarship that allowed me to earn my Building Operator Certification last December. Running a facility and its systems is incredibly complex and this training helps me stay current with best practices. 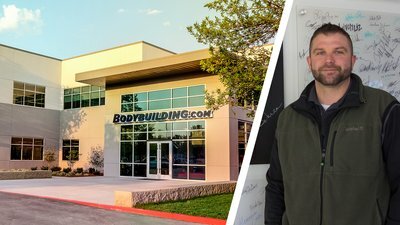 Just being able to say I work at Bodybuilding.com is something I am very proud of. In my time here, I’ve made a lot of friends, worked on a ton of unique projects, and enjoyed the experience of working with the founder. Bodybuilding.com Is Known For It’S Awesome Benefits And Fun Culture. What Is Your Favorite Perk? My favorite perk is easily the company gym. We have poured a ton of work into it. My direct manager, Dylan, and I started inviting employees to help us clean up the gym and restack weights and equipment. Before we knew it, more and more employees came down to help out. It started out a small idea, but has become a regular activity named the “Friday Fix”. I have made some incredible friendships with the people here. At a point, I was going through a difficult divorce. Many of my co-workers were supportive during this time, especially my direct manager Dylan. He constantly gave me reassurance and the confidence to come out of that experience a better man. Fishing on the columbia river, from left to right: dylan, trip guide, and jim. The team members here are so inspiring and motivating to be around. I have participated in 3 employee transformation challenges and have lost over 30lbs. I stay active with my two daughter’s soccer and flag football activities and we workout at home as a family. I know my influence on my kids is huge and I want to be the best role model I can be. Do You Have A Favorite Bodybuilding.com Athlete Or Role Model? I often meet athletes when they visit. One of the most memorable visits for me was meeting retired New York Giants kicker, Steve Weatherford. He went out of his way to record a personal video for my kids and I even got a signed football. It really meant a lot to me. Driving race cars has been a passion and hobby since I was 16 years old. In total I have placed in the top 5 in 13 races and taken first place in 9 races. After winning my last race I was flown to the Nascar Hall of Fame awards banquet in 2013 where I accepted my award. I even had dinner with Kyle Bush - that was pretty exciting. In 2013, jim took first place racing his short stock race car at the magic valley speedway. Thanks Jim! We Are Happy To Have You At Bodybuilding.com!